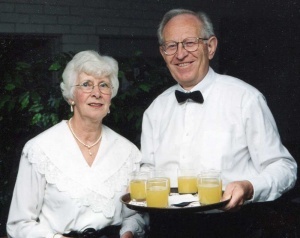 Ann and Arnold Baerg, 2005. Family photo. Arnold Baerg: guidance counselor, high school administrator, board member; born 9 December 1928 in Crowfoot, Alberta to Aron and Gertrude (Willms) Baerg. Arnold was the oldest child in a family of four sons and two daughters. On 28 August 1954 he married Ann Willms, daughter of John C. and Martha (Dyck) Willms. They had two children: Cheryl (husband Ken) Creech; Kerry (wife Colleen) Baerg. Arnold died unexpectedly of heart failure 14 January 2008 in Vancouver, British Columbia during a family visit. Memorial services were held in Abbotsford and in Waterloo, Ontario. During 1925 and 1926, Arnold Baerg’s parents fled persecution in the Ukraine and immigrated to Crowfoot, Alberta. The 1930 depression, drought and crop failure forced the family to abandon their farm and move to Coaldale, Alberta. Young Arnold’s faith was nurtured by his parents in the Coaldale Mennonite Brethren Church where his father was an ordained deacon. When he was lost in the bush during a prairie dust storm, Arnold made a vow to God. As an 11-year-old, he later confirmed this vow with a definite commitment while listening to Charles E. Fuller’s radio broadcast. He was baptized in the Bow River and became a member of the church he grew up in. With the encouragement of his parents, Arnold took full advantage of furthering his education. He attended Coaldale Bible School and the Mennonite Brethren Bible College in Winnipeg, where he met Ann. When they moved to Ontario, Arnold pursued teacher training. Arnold’s teaching career began in Petrolia, Ontario and continued in Kitchener-Waterloo. For 15 years he was head of the counselling department at the Waterloo Collegiate Institute (WCI) in Waterloo and for seven years at Waterloo Oxford District Secondary School in Baden, Ontario. He also served as vice principal at WCI. During a sabbatical in 1980 to 1981, he finished all the course work toward his doctoral thesis. Together with his family, Arnold spent two years, from 1968 to 1970, teaching in Cali, Colombia, under the auspices of Mennonite Brethren Mission Services International. After an early retirement he spent ten years on staff at the Waterloo Mennonite Brethren Church working in pastoral care and ministry to newcomers in the church. Arnold was a beloved teacher and guidance counselor and also involved with Interschool Christian Fellowship and Teachers Christian Fellowship. He was a founding member of the Waterloo Mennonite Brethren Church and served several terms on the church leadership board of the church, besides teaching Sunday School and small groups as well acting as a youth leader. His many interests included refugees, First Nations concerns, capital punishment and Old Order Mennonite concerns about government pensions. He served on the boards of: Mennonite Central Committee Ontario (MCC Ontario), Camp Crossroads, Mennonite Brethren Bible College and others. From 1972 to 1980 he served as secretary on the MCC Ontario board where he brought a healthy balance to the then-perceived dilemma of whether to consider MCC’s task as supplying aid relief or spreading the Gospel. Arnold Baerg came from a conservative church in Coaldale. He remained true to its spiritual mandate but his life came to encompass a much wider sphere of the Kingdom of God. “Arnold Baerg.” Mennonite Brethren Herald 47, no. 3 (March 2008): 29. Web. 25 January 2012. http://www.mbherald.com/47/03/deaths.en.html. Baerg, Arnold. Interview by Linda Huebert Hecht. Waterloo, Ont. (10 November 1997). Mennonite Central Committee Ontario Oral History Project.Mennonite Archives of Ontario. Funk Wiebe, Katie. “Interview with a High School Guidance Teacher.” The Canadian Mennonite 10 (27 July 1962): 1, 8. Jantzen, Erica. "Baerg, Arnold (1928-2008)." Global Anabaptist Mennonite Encyclopedia Online. January 2012. Web. 21 Apr 2019. http://gameo.org/index.php?title=Baerg,_Arnold_(1928-2008)&oldid=142695. Jantzen, Erica. (January 2012). Baerg, Arnold (1928-2008). Global Anabaptist Mennonite Encyclopedia Online. Retrieved 21 April 2019, from http://gameo.org/index.php?title=Baerg,_Arnold_(1928-2008)&oldid=142695.